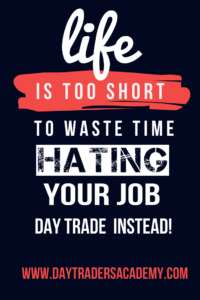 Home Day Trading Stop Wasting Your Time In A Job You Hate! Stop Wasting Your Time In A Job You Hate! Learn to day trade. I’m not going to lie or mislead you or say it’s easy but… With enough practice and the right step by step plan it’s possible. Also make sure to join the Day Traders Academy V.I.P. group so that we can send you weekly training videos and market updates. Since 2003 I’ve written 5 books on trading and taught over 14,000 students in more than 73 countries. I love sharing my knowledge and I’ve found by accident that mentoring others actually helped me become a more profitable trader.